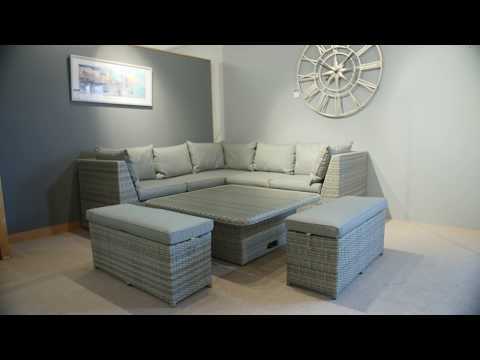 The Kensington outdoor furniture range is crafted using a delicate double woven petan in a luxurious soft grey. It comes with durable, all-weather cushions for style and long-lasting comfort. This modern, contemporary design is gauranteed to upgrade your garden space whether it be a compect terrace or a spacious green. With the innovative adjustable-height table, you'll no longer have to choose between lounging or dining in our outdoor space. Low maintenance all weather weave, leave outdoors all year round. Durawood coffee and dining set top. Durawood is resistant to scratches, wine stains, UV resistant and highly durable. Adjustable-height table for coffee with friends or al fresco dining.